Most native U.S. toads are beneficial in the landscape. Cats quickly learn to leave them alone. Most toad encounters end harmlessly for cats. If your kitty decides a toad might be a toy or food, she’ll get a distasteful lesson: Leave toads alone! However, encounters with two toad species, limited within the U.S. to extreme southern habitats, can be fatal to pets and other animals. A frightened toad excretes a toxic substance via the parotoid glands found in the skin behind the eyes. If your kitty bites or licks a toad, she’ll probably get the awful stuff in her mouth. The desired result from the toad’s point of view is that Kitty will spit him out and leave. Most toad species native to North America release toxins that are more disgusting than dangerous when they are frightened. Still, your cat could have a bad reaction if she's sensitive, or if she swallows the toad instead of letting go. A panicked toad also might urinate. That won’t harm your cat, but it will help enforce the idea that toads aren't toys or snacks. If you notice your kitty foaming at the mouth, she might have tasted a toad. She may also drool, vomit, paw at her mouth and shake her head in her attempts to get rid of the awful substance. Her gums often will be red. Usually these symptoms will fade within a few hours, but you should consult your vet when you see them. If you didn't see the encounter, the symptoms may have another cause. Either way, you need to determine whether Kitty needs medical attention. Once your kitty has had her encounter with a toad, she’s likely to avoid all frogs and toads. This is in everyone’s best interest, including yours. 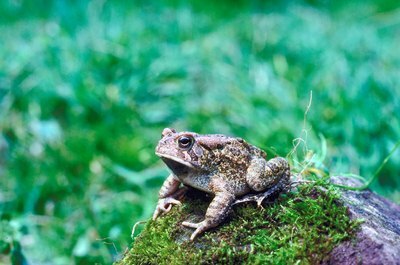 Toads offer free natural pest-control services in your landscape. A single American toad will eat up to 10,000 slugs, bugs and other garden pests in a season, according to the University of Georgia's Warnell School of Forestry and Natural Resources. . If you live in Hawaii or some limited areas of coastal southeastern and southwestern Florida or extreme southern Texas, your kitty could encounter a cane toad, also known as a giant toad or marine toad (Rhinella marina). This is an invasive imported species in Hawaii and Florida, a toad that is twice as large as native U.S. toads. Its venom can kill a pet. A native toad species, the Colorado River toad or Sonoran Desert toad (Incilius alvarius), is another large toad whose venom can kill pets and other animals that try to eat it. This toad is found throughout Mexico and in desert localities in southern Arizona. It rarely is found in extreme southwestern New Mexico and California's Imperial Valley. Adult cane toads range from 6 to 9 inches in length, while adult Colorado River toads range from about 4 to 7 inches. Symptoms of encounters with these toads include difficulty breathing, seizures, paralysis of the back legs and irregular heartbeat. Seek emergency treatment for your kitty if you see any of these symptoms. "Can Cockatiels, Dogs & Cats Live Together?" Can Cats Get Sick From Eating Frogs?